"Hi Norman, the pen arrived yesterday. 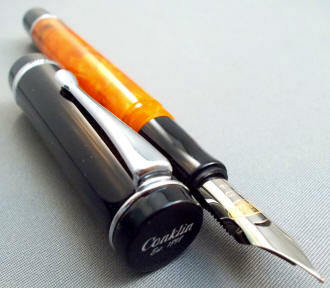 This is my first Conklin and first stub nib - very smooth writing pen, love it. With its amber body and black nib, this Duragraph looks beautiful and feels great! Thanks for your guidance." "Norm! My first order - the Conklin with 1.1mm italic and Supergreen ink - has arrived. Thanks for the note. This pen is AWESOME! It wrote from the get go - that has never happened bar the very expensive Delta I have. I love the writing style I have miraculously acquired! Ha I can actually read what I have written. You are on a winner here Norm. Kudos to you from Down Under - where it is a balmy 100 degrees F. Kind regards,"
"Hi Norman: Thanks for the beautiful Conklin Duragraph "Cracked Ice" fountain pen. It just arrived, certainly in time for Christmas! I knew the " F" would be closer to an "EF" and that's just what I wanted. I love the high pen clip. As always, so well set up, and after a little soap flush, a beautiful writer. Thanks again and have a great Christmas!" "Thanks, Norm! 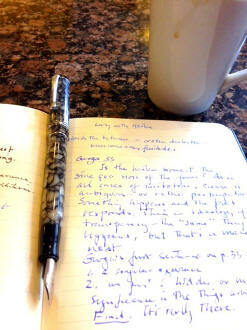 Lovely light well-balanced writer (stub) and it rhymes with the writing table at the cafe!" 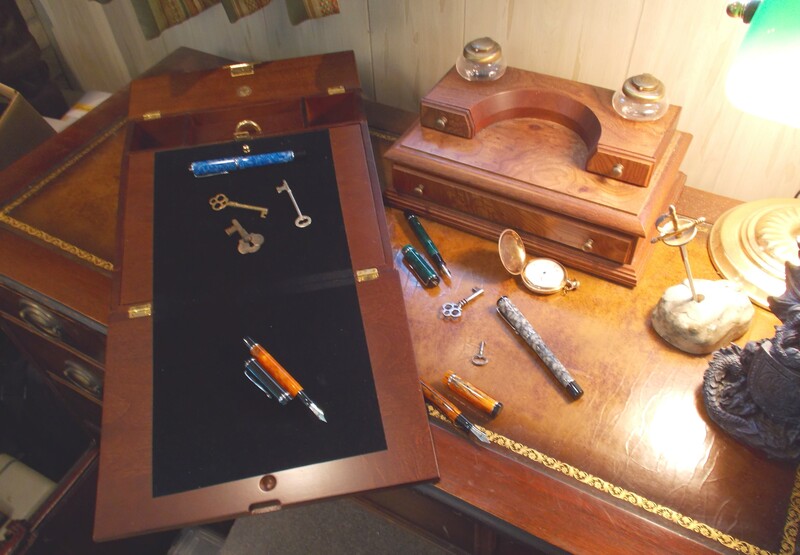 "Dear Norman, the Forest Green Duragraph arrived today, and I can see why it is a popular seller. 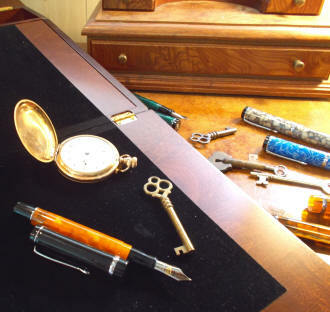 It is a most attractive pen and well represents the proud history of the best pens of past years. Even better, it is a fine writer and does not disappoint in the least. Private Reserve Spearmint will be the perfect ink for this pen, and I will need to order some once this Christmas madness is over. I love the two-pen pouch that Lai Yee has made, and I want you to thank her for the care she took to make it; thank you too, Norman, for including it as a free gift with my order...Thank you very much for the fine merchandise and excellent service during this past year, Norman. I hope you all have a most wonderful Christmas and the very best in the New Year." 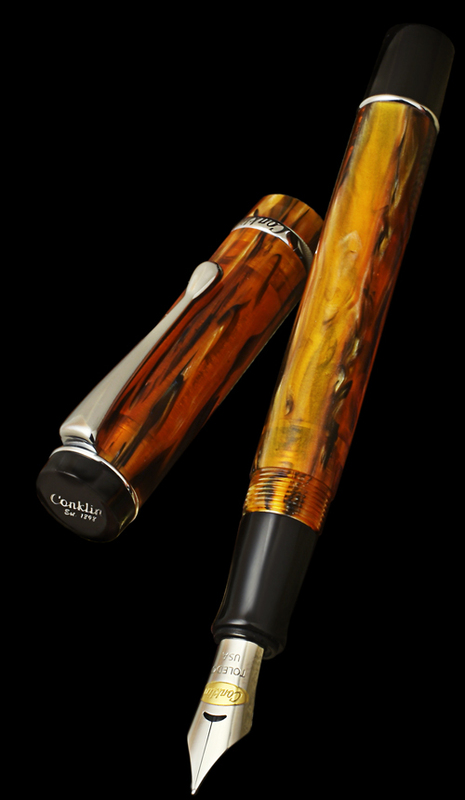 Conklin re-introduces a new -- and its most affordable pen series -- the Duragraph. Read more about the history of the original Duragraph here. It appears that Delta pens of Italy is on its last legs financially at the time of this writing. 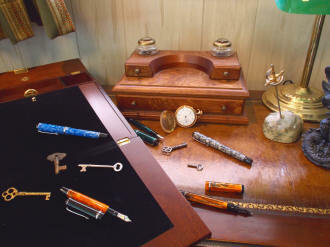 Founded in 1982, Delta has produced over the past 35 years some of the world's finest fountain pens. 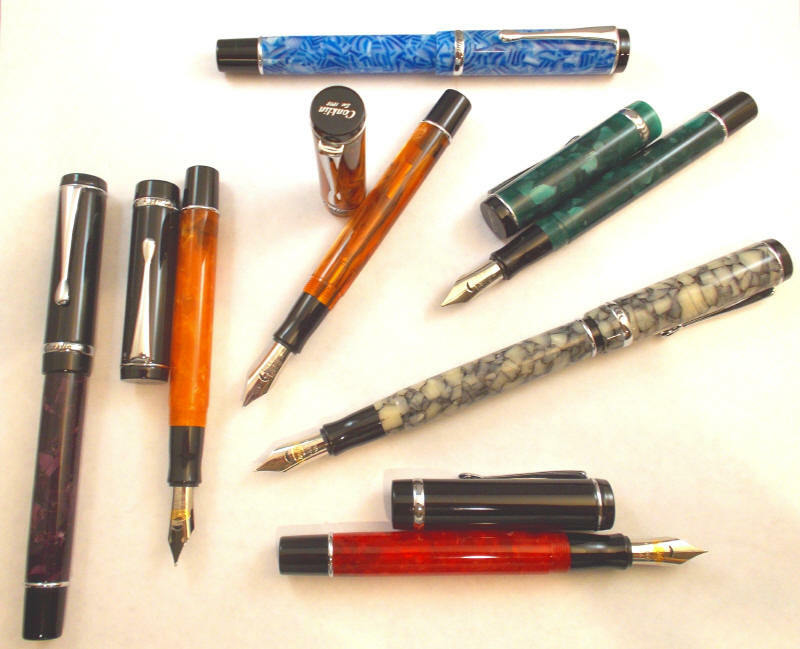 When a collector thinks of Delta, most often the many models of the Dolcevita line -- with it's distinctive orange resin -- is what first comes to mind. The American company YAFA, based in California, has been the U.S. distributor for Delta for much of that time -- and has often been involved in the design of new models. YAFA is also the manufacturer of Monteverde and Conklin pens. 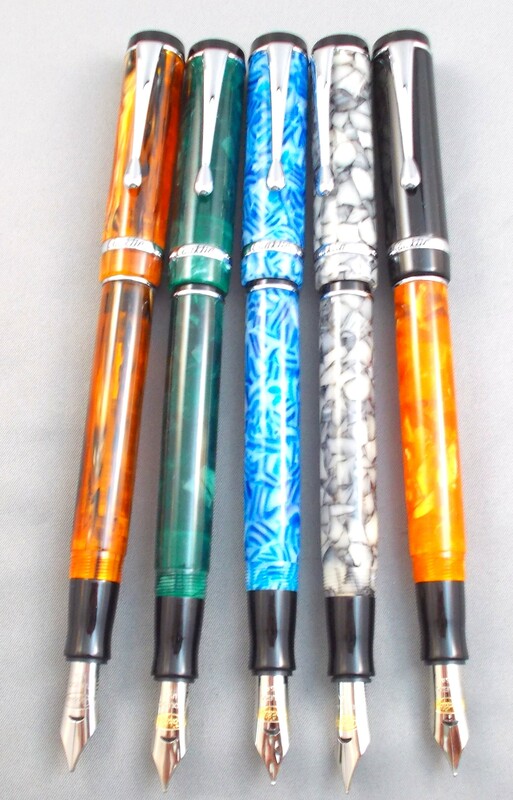 In homage and appreciation of Delta's Dolcevita line, the decision was taken to add a new pen to the Conklin Duragraph line -- the Orange Nights -- to preserve the iconic color scheme of the great Dolcevita models -- two of which are shown here on either side of the Duragraph (the Stout on the left and the 20th Anniversary lever-filler on the right). 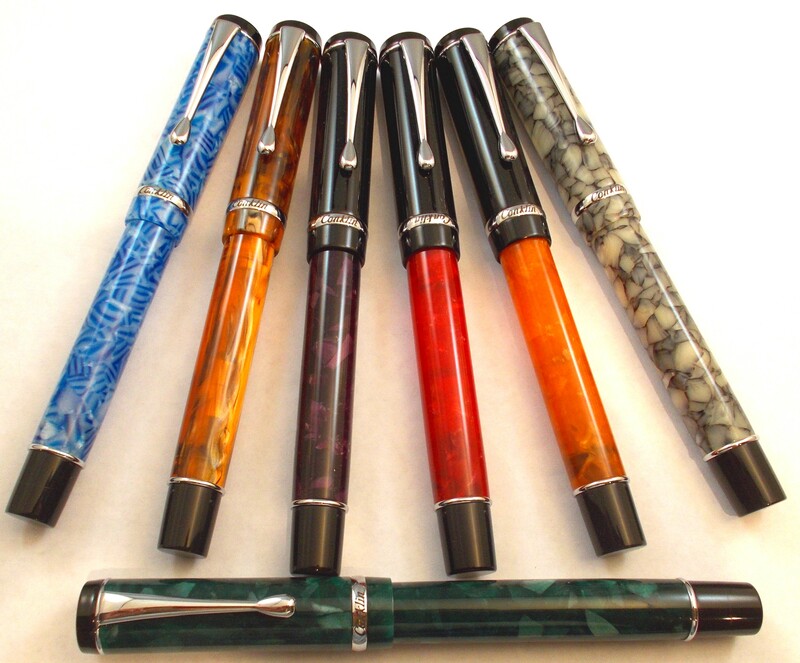 Available in three spectacular hand-made resin patterns, each pen is inherently unique and no two will appear to be the same. These are full-sized pens, measuring 5-1/2" capped, 6-7/8" posted and 4-7/8" with cap held aside. 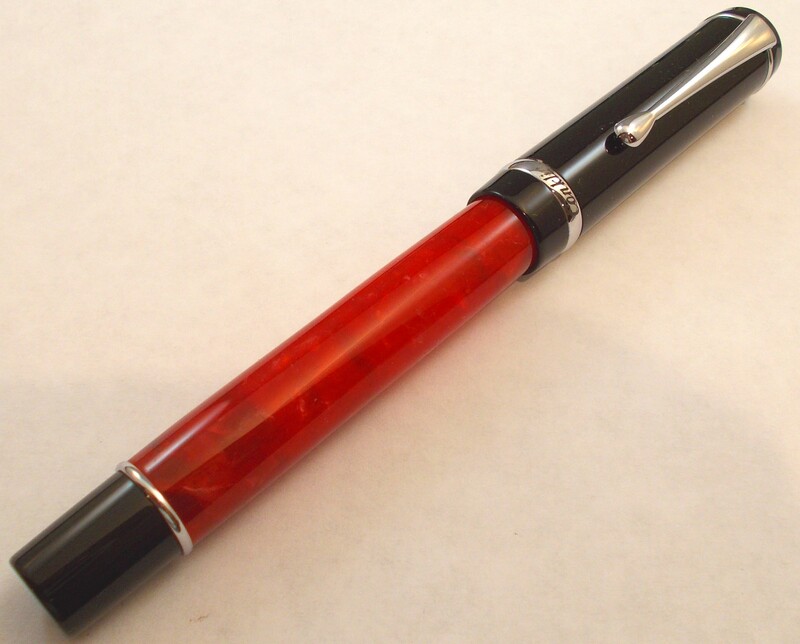 Despite the length when posted, the pen is well balanced both posted and without cap, and still lightweight as it's a resin pen. As many of you know, one of my personal favorite pens is the Monteverde Prima. One often occupies my shirt pocket for the day, and I find enough similarities with the Duragraph that I think this will be a pocket companion as well. 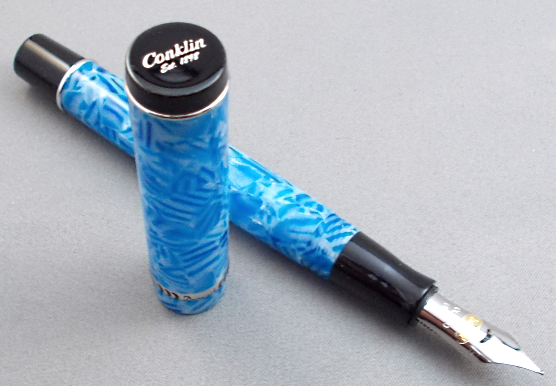 Conklin really hit a homerun with these gorgeous resins. The simple chrome trim allows all of one's attention to be focused on the unique to each pen resin patterns. The cap top is engraved with Conklin and est. 1898 in script, while the center cap band reprised Conklin beneath the clip and three crescents on either side of Duragraph upon the reverse. The cap screws off of the barrel and is friction fit should you choose to post it. 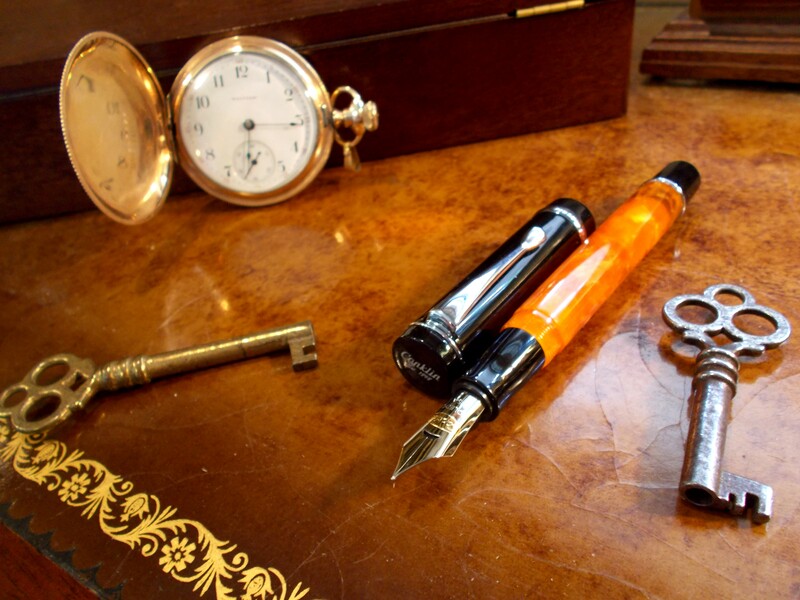 Unscrewing the cap displays the two-toned steel nib (the stub nib is monotone) which is engraved with the Conklin brand name and the historic “Toledo, Ohio, USA” mark. 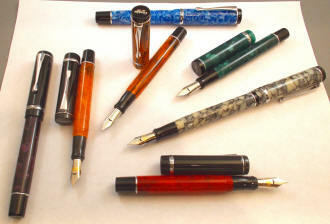 The nibs are available in M, F or the new stub sizes. 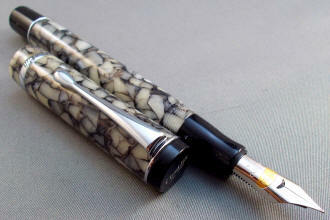 I've found that the Conklin nibs run about a size smaller than typical western nibs. Hence, I'd classify the M as a fine and the F as an x-fine. The stub is a 1.1 mm medium. Please specify the nib size you'd like, by letter or 'stub' only, to avoid confusion when ordering. 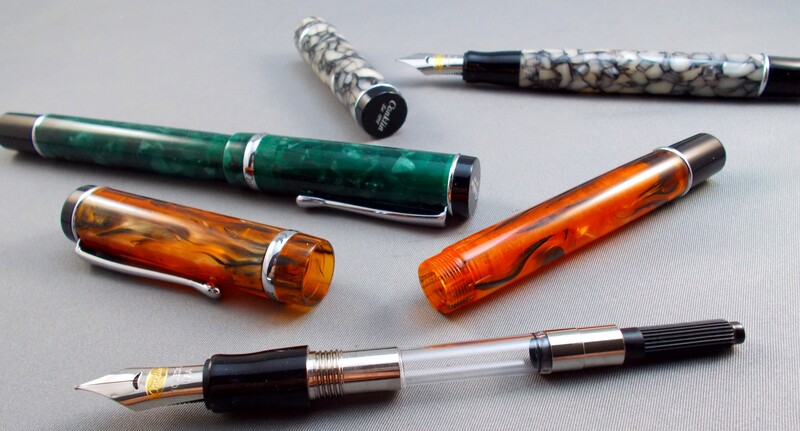 The fountain pens come with a screw-in piston converter for bottled ink...but as with all new pens, I recommend to run a dilute solution of dishwashing soap (two or three drops to a small bowl of water) through a new pen a few times, followed by water only. Step one is effective at removing manufacturing oils that can tend to make the ink less than enthusiastic in heading from the converter/filler to the nib, and step two removes the traces of the detergent you've used...which tends to have the opposite, diuretic effect. 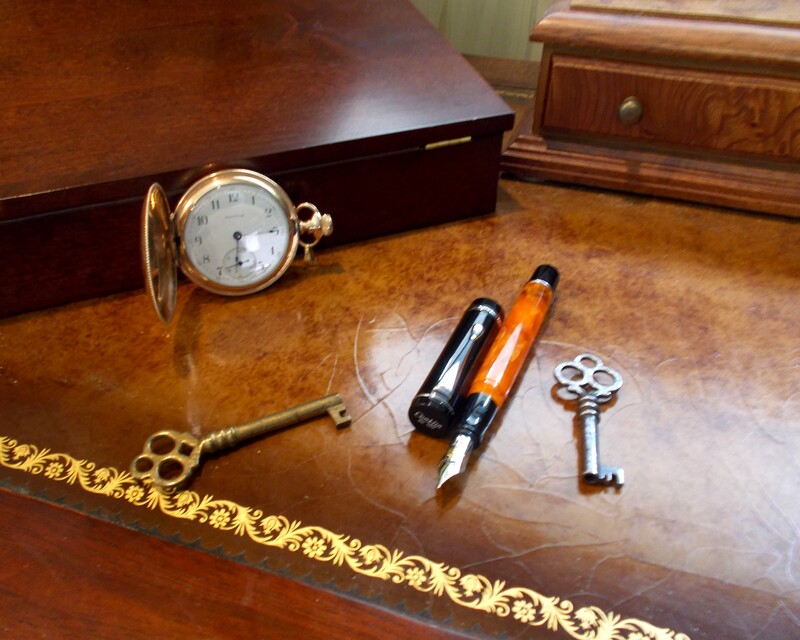 The pen will also take International-style cartridges, such as those from Private Reserve. 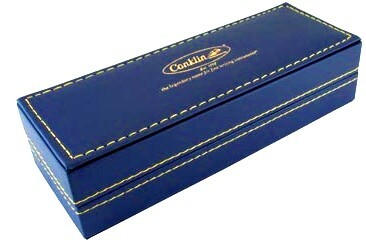 The large, blue Conklin gift box, starter cartridges and warranty are included. Innovator Roy Conklin successfully created the first Self-filling fountain pen - promoted as 'a fountain pen that has its own stomach' which became much loved by renowned American author Mark Twain.